Balangan Beach Bali Surfing - Surf Your Waves! Balangan Beach is endowed with great waves and has become a magnet that draws surfers from all levels to experience and enjoy their surf adventure here. Other than waves, this beach is also known for the panoramic beauty, with a golden beach, lush green vegetation, cool sea breeze, and romantic sunset. The beach is located on the west side of Bukit Peninsula, in the district of South Kuta, Badung regency, Bali. This beach has easy access, strategic and close to other famous surf points in Bukit Peninsula. 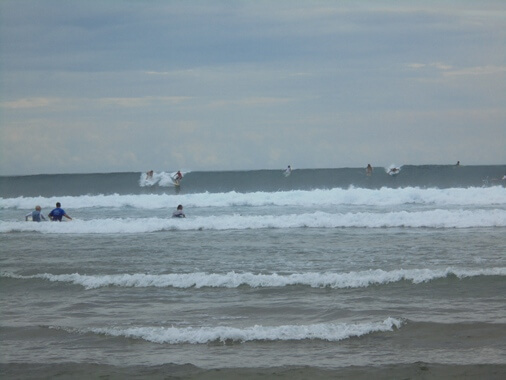 The best season for surfing at Balangan is on dry season (April-October). The reef is right in front of the beach and just need a short paddle. The wave is very fast and hollow, best on the mid to high tide. 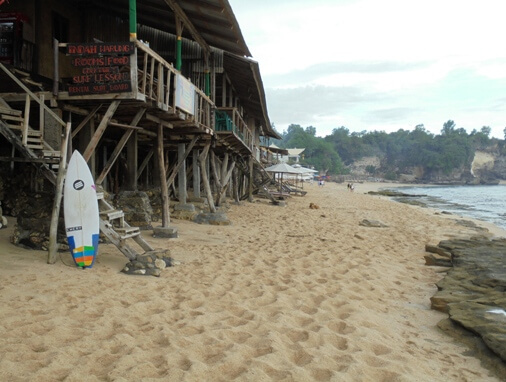 Balangan beach features very classy waves, with the best wave size averaging from 4ft to 8ft. You can refill the energy with dishes served by restaurants and food-stalls along the shoreline. Enjoy the meals, cold drinks or cocktails while waiting for time to surf again. Overall, this beach is impressive, amazing view and the Balangan Beach surf spot is one of the best surf spots in Bali.